It’s been a great learning journey to date. Six years on and The Tertiary Prep Programme a la 2015 only vaguely resembles the unit designed in the fledgling days as I tentatively began forming my thoughts about preparing students for the transition to further study. After presenting on the work I had begun at Hargest at the LILAC Conference in 2012 I had a whole new lens thrown across it when I began working at Southland Boys’ High School. Two years of further thinking, trialling, talking and tweaking has now led to the development of a programme designed not for just one particular school, but for any school wanting a solution to bridging the gaps between secondary and tertiary study. So at the end of last month, at a workshop presentation during the recent SLANZA Conference I launched The Tertiary Prep Programme to a group of librarians and teachers. Why should we be considering this type of programme in our secondary schools? Recent research out of Massey University, published in the current SET magazine indicates areas of concern in how prepared students are for the switch to tertiary learning. Lisa Emerson and fellow researchers Angela Feekery and Ken Kilpin make some clear conclusions from their work with a group of secondary and tertiary teachers. Watch out for a blog post on The Tertiary Prep Programme website about this article, Lets talk about literacy: preparing students for the transition to tertiary learning, in coming days. 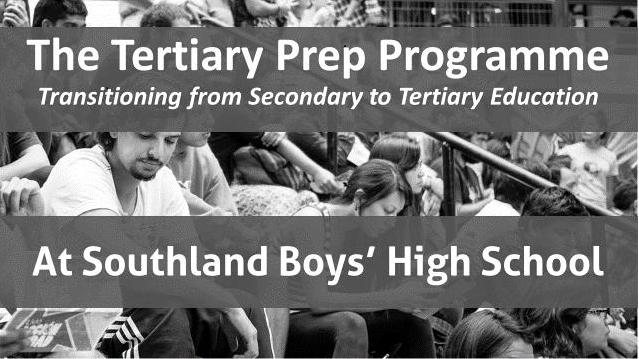 If you are interested in learning more about The Tertiary Prep Programme, visit the website, check out the resources and follow the site. I would like it to grow into a community of educators who can share ideas, thoughts and suggestions with each other. If you’re interested in my next steps with tertiary prep or you’d like my brief summary of the issues and mitigating factors relating to the research article then be sure to take a look at my conference presentation on Slideshare. And if you’d like support towards embedding a tertiary prep programme in your school, please don’t hesitate to contact me as I’d love to work with you!